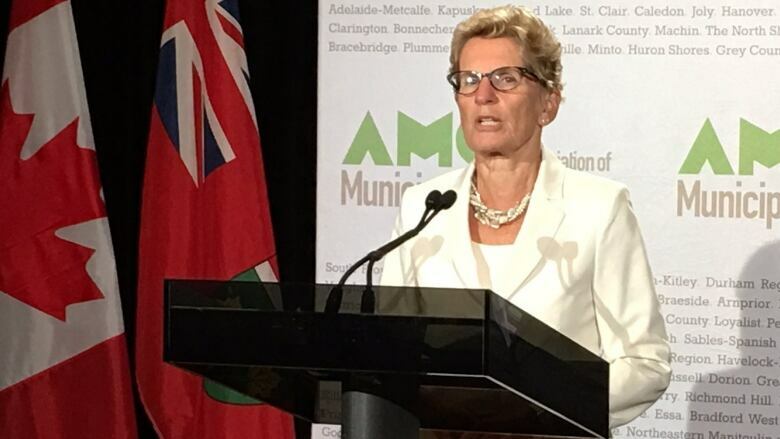 Premiere Kathleen Wynne, who spoke to municipal leaders at the Association of Municipalities Ontario conference this week in Windsor, Ont., said she's heard multiple opinions about potential revenue tools for cities and towns. She wants to give municipalities more time to figure out what will work for them. Wynne told local politicians attending the annual meeting they need to decide among themselves exactly what types of "revenue tools" they would want to introduce. "I'm not saying that there would be 100 per cent consensus, but I don't think that the general public has had the opportunity to have this conversation," she said. "It's not something that's on people's radar, and I think that's what municipalities now need to do, is have that political discussion. "There is not one solution that fits all and so we need to consider how to get this very important decision right for everybody." Toronto, for example, has a special exemption under the Municipal Act, which allows them to generate revenue through certain taxes and fees paid only within Canada's largest city. Toronto is the only one of the 444 municipalities in the province with the authority to raise revenue by imposing levies such as a land transfer tax or a vehicle registration tax, but it cannot introduce sales or income taxes. Wynne said the discussion so far has been about giving other municipalities the same powers as Toronto, and indicated she's open to whatever ideas they come up with. "When our government hears what that near consensus is on the specific ways you want to raise additional revenues for your community, we'll work for you in a transparent and open way to make those additional tools available," she said. Windsor Mayor Drew Dilkens wants a more blanket approach. "It's worthy of taking a cautious approach here because we don't want to open Pandora's Box and have all municipalities charging a variety of different user fees," said Dilkens. He thinks adding taxes in one region and not in another could be bad for business. "If we had other types of permissive powers and we did it, but other municipalities next to us didn't do it, then we create a bit of a competitive disadvantage," Dilkens said. An example of an additional municipal tax might be a tourism tax charge on hotel room rates. It was the first time Leamington Mayor John Paterson heard about the idea of allowing municipalities to charge taxes and fees. He wonders if the new revenue would be similar to Toronto's ability to collect revenue outside of property taxes. "It's a little bit dangerous for most of us taxpayers to hear; that municipal councils are going to have that ability to tax us on something," said John Paterson, "but hopefully we can all find a responsible way to do that." Businessman Larry Horwitz, who owns several properties and banquet and is the head of the Downtown Windsor BIA, believes the region is taxed enough and that it would be a huge problem for local business. "Taxes on services [and] business tax are really high," Horwitz said, "And then you top that with utilities that are just crazy. How do you maintain a business in Windsor, especially a small business, when you barely get through and get enough money to take care of your family and put the necessities on the table?'"